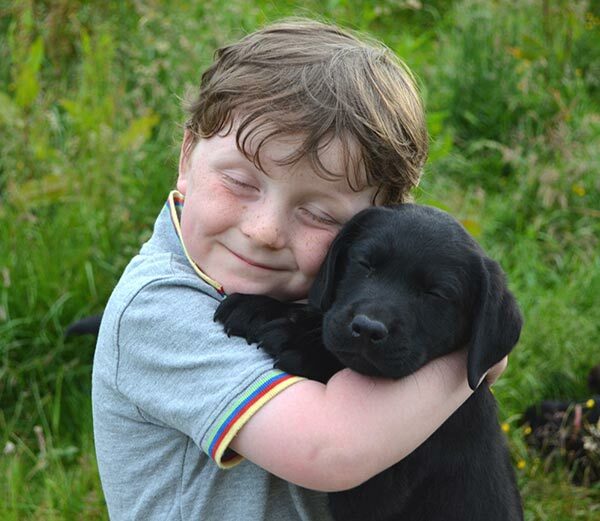 Dogs for the Disabled dogs are specially trained to assist physically disabled children and adults to carry out a range of practical tasks and to provide stability when needed. Each dog is trained to cater for the needs of their specific partner to enable them to live life with greater independence. See what our amazing dogs can do! This video shows Lauryn’s first steps, unaided, as she learns to walk with the help of her assistance dog Graham, in her first training session with our CEO Jennifer Dowler. Watch their increasing confidence as they take on the streets of Cork and a busy shopping mall! Lauryn now walks to school and back most days, an average of 1 mile a day, she’s getting stronger, her heels are getting closer to the ground. Most of all she’s happy, and proud. Lauryn has astounded her teachers and Physiotherapist with her new ability. Feebie is a stability and task dog paired with Paul, who has Ataxia and is a Dogs for the Disabled ambassador. Feebie helps Paul to walk and to get out and about together, and this video shows the variety of tasks Feebie assists with. Feebie and I have only been together for a short time but has already she made a huge impact in my life. I can’t imagine her not being there. Lyn is a wheelchair user who is partnered with Fern. Fern has been trained as a task dog to open doors, retrieve items and help Lyn to live more independently when at home and when out and about with Fern. Fern is not just a fantastic worker she is also a wonderful companion. She is full of personality and has made our home a much happier place. I now couldn’t imagine life without my amazing Fern!